On Friday the 6th of April, we celebrated having successfully paid out 100 000 property finance deals. 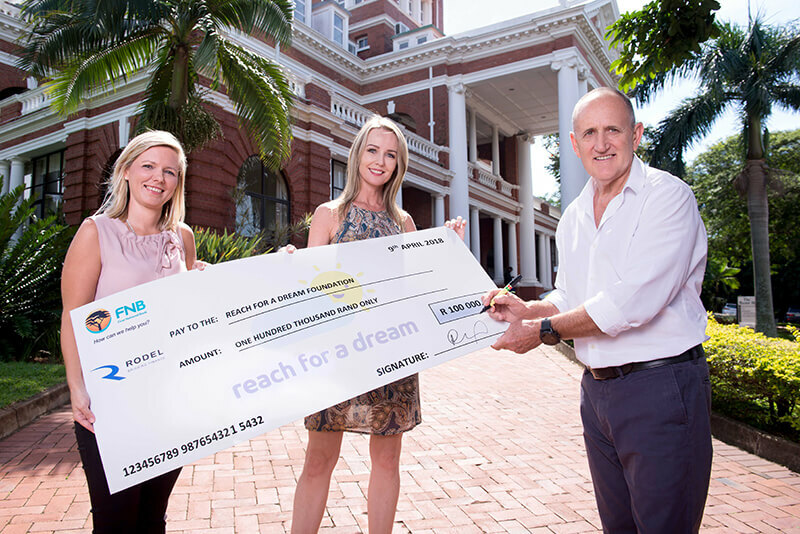 In celebration of this milestone, a donation of R100 000 has been made to The Reach For A Dream Foundation. This donation will allow us to fulfill the dreams of 30 children who have life threatening illnesses and will unfold from May. Pictured from left: Kerry Donkin (RFAD Brand Manager), Mel Lourens (Rodel’s Executive Director) and Andrew Church (Rodel’s CEO). Photo credit: Val Adamson. The handover ceremony took place earlier this month in The Manor House gardens in Morningside, where our Head Office is situated. Our CEO, Andrew Church said, “Reaching 100 000 successful transactions has been one of my proudest moments since Rodel’s inception 18 years ago. Knowing that we have provided solutions for over 100 000 property related deals coupled with our growing national footprint, reinforces us as market leaders in a niche environment.